Today, in the interests of transparency, we publish our response to a July 2018 letter from the Handicraft & Wood Industry Association of Ho Chi Minh City (HAWA), Vietnam, taking issue with our recent report Serial Offender – Vietnam’s continued imports of illegal Cambodian timber. Thank you kindly for your letter to the Environmental Investigation Agency (EIA) dated 5 July 2018 regarding our May 2018 Serial Offender report. EIA is appreciative of the various positions and actions that HAWA has adopted towards reducing illegal logging and illegal timber trade in Vietnam, including HAWA’s signing of the May 2017 joint statement of Vietnamese timber associations committing the organisation to “Say No to Illegal Timber”. EIA similarly believes our respective organisations share long-term goals and remains hopeful they can be successfully achieved, including through reforms Vietnam is adopting in lieu of the FLEGT VPA negotiations with the European Commission (EC). EIA acknowledges commitments made by Vietnam’s wood industry businesses, including HAWA and its members, to eliminate illegal timber from supply chains and raise awareness of these matters. EIA made no comment on this in our report and therefore understands your first point as making no comment on our report. 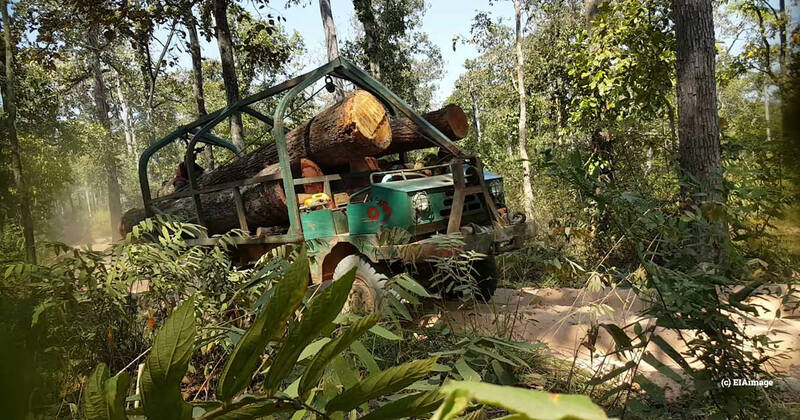 EIA’s focus on three illegal logging hotspots in Cambodia “is not scientifically acceptable”, is not “representative” and is “misleading”: EIA did not attempt a “scientific” study but instead conducted field research that revealed significant illegal timber operations occurring in three areas of Cambodia. At no point did EIA suggest the logging areas were “representative” of Cambodia as a whole. Instead, EIA reported what was encountered on the ground and how investigators tracked timber from those criminal activity hotspots to the Vietnamese timber market. EIA refutes any suggestion that our reporting on these three illegal logging hotspots “misleads” anyone. EIA rejects any suggestion that our reporting is misleading, inaccurate or not representative of the facts on the ground. Estimates of production and trade in and from each of the three illegal logging operations EIA documented in Cambodia (presented in Evidence from the Ground, page 19 of the report). EIA explicitly recognised and acknowledged the significant discrepancy between the very high volumes of trade suggested by field estimates and the lower volumes indicated in the other two data sets we referred to. At no point did EIA suggest that the volumes derived from field estimates were factually correct. While the report did question whether the official Vietnam Customs data and the import declarations data did actually capture all of the trade that field observations suggested could be occurring, the report intentionally made no firm conclusions on the actual volume of trade that has occurred over the period of our study. Indeed, EIA went out of its way to clarify that uncertainty over volumes exists, as evidenced by this concluding paragraph on the matter from page 19 of the report. The report explicitly cited the Vietnam Customs data that was available at the time of publication as 435,764m3 of log and sawn timber imports into Vietnam from Cambodia worth a combined $213 million during 2017 (data for January-March 2018 was not available at the time of publication). The importer declarations data available to us, which corresponds very closely to published Vietnam Customs reports, did include declarations up to March 2018 and this was also reported in Serial Offender as amounting to 178,119m3 of logs and sawn timber worth $75,800,641 entering Vietnam from Cambodia during the 2017-18 logging season (September 2017 – March 2018). EIA sees no inaccuracy in this reporting (EIA reported everything) and considers it to be a fair evaluation and representation of contradictory but valid sources of available information. EIA is not aware of the “enormous effort of Vietnamese Government in strengthening the control over import from Cambodia”: At the time the report was written and published, there was no publically available evidence of an “enormous effort” of Vietnam to stop this ongoing and persistent illegal trade. While we acknowledge that there is ongoing attention from the Government in working towards a FLEGT VPA, EIA has not seen any information that shows what the Vietnamese Government may have done to control imports from Cambodia. In contrast, there was plenty of evidence available that Vietnamese state officials had been complicit in the illicit trade for a number of years and continue to be so. EIA understands that the two specific actions your letter explicitly refers to actually took place only in March and April 2018 and remain largely untested and poorly communicated by the time our report was published. Nonetheless, EIA acknowledged in the report that some very limited action appeared to have occurred in Vietnam while writing the report, as evidenced by the final paragraphs of the Introduction. EIA can only hope that significantly more effort is exerted by the Vietnamese state to stop the timber crime on its border with Cambodia, as I am sure HAWA does as well. “Failed results derived from incorrect study methods”: EIA rejects HAWA’s mischaracterisation of EIA’s work. Our study methods successfully exposed a multimillion dollar smuggling racket that neither the governments of Vietnam nor Cambodia appeared willing or able to reveal. In Vietnam’s case, it appears to have failed to identify the problem until February or March 2018 – and to our knowledge has achieved virtually nothing in bringing these crimes to light or in preventing them. If any action has been taken it has not been made publicly available. This is despite the fact EIA had exposed an almost identical pattern of crime involving Vietnamese Government corruption the preceding year in our May 2017 Repeat Offender report. “Mr Wadley’s Comments are fail”: Your letter highlights a quote from the press release accompanying the Serial Offender Report – “Vietnam has a long history of stealing timber for its neighbours” – and alleges the substance of the quote is “fail”. EIA notes that HAWA has not contested the accuracy of the quote itself (nor in our view could do so) but merely suggested that it “devalue the report” while advising EIA that many wood companies in Vietnam do not use Cambodian timber. EIA agrees there are many wood companies in Vietnam that don’t use Cambodian timber, but that does not mean our statement is not also true. EIA believes that the quote accurately reflects reality – Vietnam has indeed been stealing timber from its neighbours for years and is continuing to do so on the Cambodian border. EIA advises HAWA to vocally advocate that Vietnam’s Government stops allowing imports of illegal timber and takes action to stop predatory Vietnamese timber companies bribing Cambodian and Vietnamese officials to facilitate illegal logging and timber smuggling. Until the Vietnamese Government does so, EIA will continue exposing illegal timber imports into Vietnam. Moving on from your explicit concerns, EIA notes with appreciation that at no point does your letter suggest EIA is wrong in characterising the Cambodia-Vietnam timber trade as illegal trade or in describing the logging underpinning the trade in Cambodia as illegal logging. EIA notes that your letter does not in any way suggest that the trade that has occurred – regardless of the volume it may have reached – was legal. EIA understands this to be an implicit acknowledgement by HAWA that the 435,764m3 of log and sawn timber imports into Vietnam from Cambodia during 2017 – as reported by Vietnam Customs – were indeed illegal. EIA similarly appreciates your kind suggestion that HAWA respects EIA’s efforts to expose and campaign against environmental crimes such as this and that you consider our report to have successfully warned respective actors of required changes to their activities – objectives that “completely correspond to HAWA’s”. In this light, EIA hopes its recent and ongoing research and reporting on timber smuggling into Vietnam continues to facilitate stakeholders in Vietnam – including those responsible companies your letter refers to – to discuss and agree actions that will stop the crime and repair Vietnam’s reputation in the timber sector. Until that happens, please rest assured that EIA will be working to ensure Vietnam’s timber market and its regulations provide a level playing field for those companies doing the right thing by excluding illegal timber. EIA believes many HAWA members will support us in our efforts to “put an end to forest crimes” – which, as your letter makes clear, is their objective. EIA agrees to publish your letter and our response to it on our website, as requested. EIA would also be delighted to meet HAWA at the next available opportunity to further discuss these matters face-to-face.